San Francisco 2019 Cable Car Ornament. 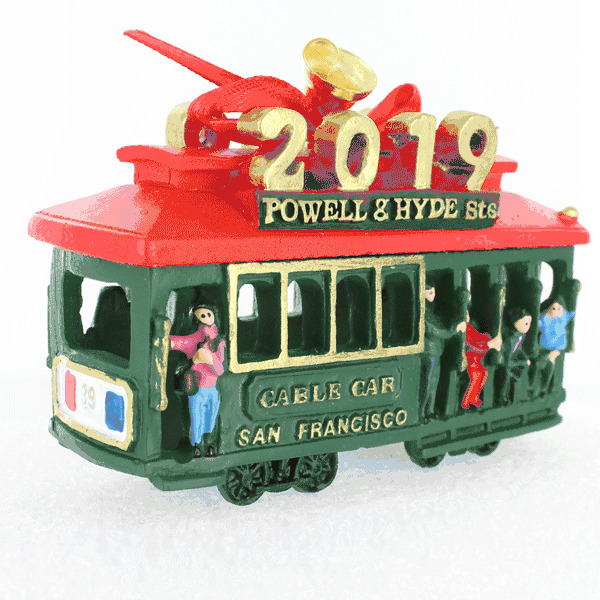 Decorate your house with a festive 2019 Cable Car ornament to bring the memories of your 2019 trip to San Francisco alive in poly-resin. This item always sells out, so please plan ahead and order early. Measures 3.25"L x 1.25"W x 2"H.
I ordered a few of these for my friends who are coming to visit me in San Francisco this month. They're very good quality for the price and really cute souvenirs/gifts! Great way to remember our time on a CableCar in San Francisco and to remember 2016 is a great year! Thanks for such a beautifully made ornament! I bought 2! Was delighted to find the ornament. Everything went smoothly, ordering, status of shipment and delivery of the product perfectly intact. This absolutely authentic SF cable car Christmas ornament is well made with explicit detail. It will, for many years to come, commerate my sister and my epoch trip to San Fran, complete with a trip to the cable car museum and a ride on a cable car. I'm extremely happy with this ornament. 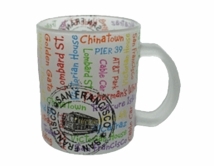 It brings back great memories of our visits to San Francisco and our rides on the cable car. I was impressed with the great quality! I ordered a cable car ornament to commemorate our 10th anniversary trip to SF this past summer. It arrive supper fast and was really nice, very impressed with the quality and service. Overall the ornament is cute and what I wanted to remember our 2016 trip to San Francisco. The black painted eyes on the people are a bit creepy, but not enough to make we want to return it. This cable car ornament is cute and appears to be very well made---not at all &quot;cheap&quot; looking despite the great price! After a trip to San Francisco last summer, my teenage daughter told everyone how much she loved the cable cars. For her October birthday, I ordered this ornament as a surprise gift. She (and everyone else) loved it! It is great quality and has fine detail. The only trouble I had was getting the sticky price tag off the inside. Some orange cleaner did the trick and it is perfect! I was thrilled with my order. Came quickly, even delivered on Sunday! There was a question about my address, your employee called to verify my address! Very pleased with your service! The ornaments were wrapped so well, arrived promptly, and are darling! 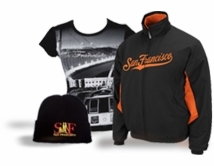 It's the perfect keepsake for our trip to San Francisco! We loved riding the cable car. I can't wait to surprise my husband with it in December. What a great way to commemorate an amazing trip to San Francisco. I bought two of these ornaments - one for myself and one for my boyfriend. The product arrived promptly and was well packaged to avoid damage during shipping. They will look great on the Christmas tree this year! I like the colors and the detail on this ornament. The price is very reasonable for everything that is included on it, from the painted people to the &quot;2016&quot; year to the gold painted hand rails. I really like this ornament. Very happy with these ornaments and delivery time. So glad we were able to find this ornament online. We were short on time while visiting San Francisco and we try to always get a souvenir ornament when we go on trips. This little cable car is well built and not cheap plastic. Love that it has the year so we can remember what year we visited. Love my piece of SF to keep on the tree for years to come! Super cute - great stocking stuffer! I smiled when I opened the box - not only because it came so fast and so well wrapped, but I think all the family members who will receive them will remember a great trip. The ornament was perfect and had great detailing. Great service and packaged nicely. Very cute ornament - the perfect keepsake to commemorate our beautiful San Francisco vacation this year! This is our 3rd tram after visiting San Francisco. We've ordered 2 from the UK and the delivery was very prompt. Great product and will buy again next year when we return to America. So happy I was able to find this ornament. I had bought one in San Francisco and left it on the trolley. This one is even better. When I was in San Francisco I forgot to get a Christmas ornament, which I collect from each city I visit. This one is adorable. It is not cheap or junky. I love the date on it. Definitely would recommend. I saw this ornament when I was in San Fran but didnt want to risk traveling with it. Shipping was quick and arrived in VA in just a few days! Excellent Service! This Ornament is one of a kind, well made and my mother loved it. Shipping was extremely fast. This ornament was just what I wanted! Great product and shipped super fast! servgreat service. I saw this when I was in the shop but forgot it. They got it to me in three days. Just in time to surprise my wife when she started decorating the tree. Perfect way to bring back good memories year after year. Purchased this as a gift. The quality was excellent & it was exactly what I wanted. I would order from The Cable Car Store, again.